Botanists call the early spring woodland wildflowers “spring ephemerals” because of their transitory natures. They emerge, bloom, set seed, and die back all before the trees above leaf out and block the sun. As late winter eases into early spring, these beauties begin popping up in our rich piedmont woodlands. Some — like American trout-lily — can make impressive colonies. I often find them on the higher end of floodplains. Many of my favorite early wildflowers prefer steep north-facing slopes, usually overlooking a creek. The dampness of the water combined with the naturally cooler north-slope environment encourages beauties like Hepatica. I always feel as if I’ve won a scavenger hunt when I spot one of these lovelies nestled on a steep, usually rocky hillside. I felt like I’d won the lottery when I realized that the steep-north-east-facing slope on our property is home to a large population of one of my all-time favorite spring ephemerals — Bloodroot (Sanguinaria canadensis). A few members of the colony adorn the top of my hill, almost looking west. Groups of plants decorate the hillside all the way down to the sandy terrace that borders the creek. Pure white petals shine like moonlight just above the brown forest floor. The flowers are quite delicate — a spring wind or rain storm will knock off all the petals almost as quickly as they appear. During calm springs, the flowers last longer — about two weeks. 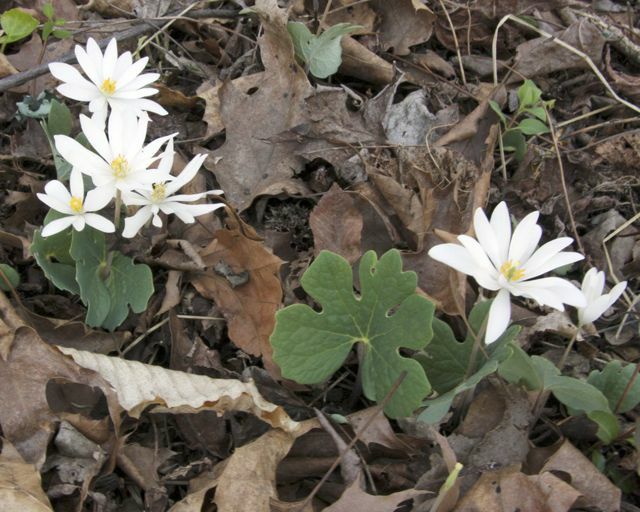 Bloodroot is highly poisonous, which is why mine are thriving despite the locally huge and hungry deer population. The plant is named for its red roots, from which native Americans created a dye. This entry was posted on February 15, 2011, 10:04 am and is filed under Favorite Plants. You can follow any responses to this entry through RSS 2.0. You can leave a response, or trackback from your own site.